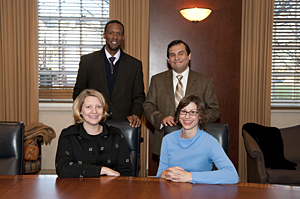 The team working on the project "Political Communication and Engagement in the 21st Century" includes, from left, seated, Dannagal Goldthwaite Young and Lindsay Hoffman and, standing David Wilson and Julio Carrion. 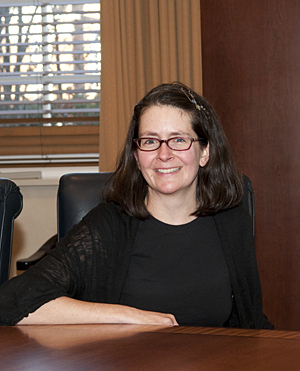 Abby Donovan will work on a project with representatives of the Philadelphia Museum of Art. The team that will focus on issues of social justice in the Americas includes, from left, seated, Carla Guerron-Montero and Monica Dominguez Torres, and, standing, Pascha Bueno-Hensen and Alvina Quintana. 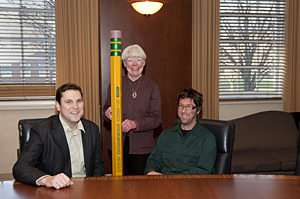 Members of the team working on a national meeting on American material culture studies are, from left, Will Scott, Debby Andrews and Lance Winn. 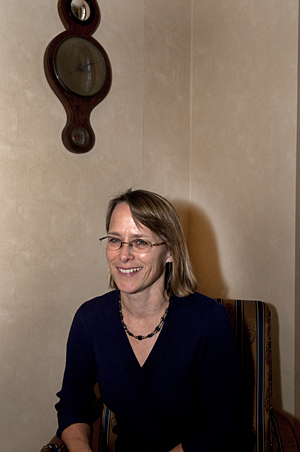 Ann Ardis, senior associate dean of the humanities in the College of Arts and Sciences and director of the Interdisciplinary Humanities Research Center. 8:32 a.m., Dec. 14, 2009----The new University of Delaware Interdisciplinary Humanities Research Center, announced last month by the College of Arts and Sciences, has reported its first round of awards. The initial awards have been made in the category of multidisciplinary research teams, and the researchers were recognized during a special event Friday, Dec. 11, in Hullihen Hall. Awards for distinguished visiting artists and scholars and integrated semester will be announced at a later date. Lindsay Hoffman (Communication), Philip Edward Jones (Political Science and International Relations), Julio Carrión (Political Science), Dannagal Goldthwaite Young (Communication), and David Wilson (Political Science), for a collaborative research project entitled “Political Communication and Engagement in the 21st Century,” an investigation of the impact that digital media technologies are having on citizens' engagement with politics. Abby Donovan (Art) to support a collaboration with Carlos Basualdo, Keith L. and Katherine Sachs Curator of Contemporary Art at the Philadelphia Museum of Art (PMA), and Adelina Vlas, assistant curator of modern and contemporary art at the PMA, for the development of a symposium to be held on the Newark campus related to “Live Cinema Live,” a PMA exhibition and visiting artists series in 2010-11 showcasing the work of young artists from Cyprus, Egypt, and Turkey who are doing cutting-edge multi-media work. 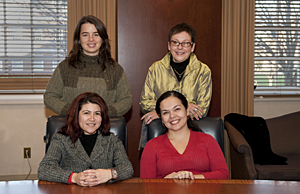 Pascha Bueno-Hansen (Women's Studies), Mónica Domínguez Torres (Art History, Latin American Studies), Carla Guerrón-Montero (Anthropology, Black American Studies, Latin American and Women's Studies), Gladys Ilarregui (Foreign Languages and Literatures and Latin American Studies), Rosalie Rolón Dow (School of Education), and Alvina Quintana (English, Black American Studies, Latin American and Women's Studies), to support the establishment of an interdisciplinary research cluster focused on investigating issues of social justice in the Americas. Will Scott (History), Lance Winn (Art), Arwen Mohun (History), and Debby Andrews (director, Center for Material Culture Studies), to support the May 2010 meeting of the national consortium for American Material Culture Studies at the University of Delaware and Winterthur Museum and Country Estate and to coordinate a set of workshops for faculty and graduate students about teaching with and learning from the diverse array of historical artifacts that constitute our material culture heritage, e.g., photographs, archival documents, decorative and fine arts, clothing, domestic possessions, toys, tools, machines, ethnographic artifacts, archeological remains, and historic sites.